Joe Raedle/Getty ImagesMichelle Obama doesn’t want to run for president — she’s more interested in helping the next generation of leaders. 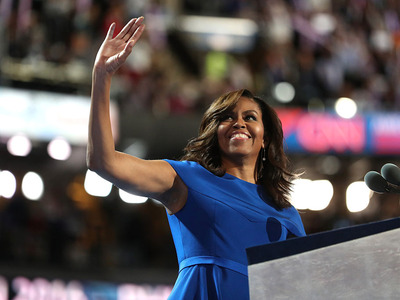 The former first lady Michelle Obama isn’t particularly interested in running for president. Obama, 54, is instead interested in “creating thousands of mes” by working with younger leaders. “As an older leader, I think an important part of leadership is stepping out of the way and making room,” she said at a conference on Tuesday. The former first lady has been meeting many younger leaders through her work with the Obama Foundation. She says it has given her a lot of optimism about their approach to leading the country. Those interactions have helped to solidify her plans, which aren’t likely to involve running for office. Rather than having one “Michelle Obama” vying for the presidency, she hopes to help more people get into leadership positions. “We don’t need just one – we need thousands and thousands,” Obama said. Obama spent eight years in the White House as the first lady. The idea of swapping spots with her husband, former President Barack Obama, doesn’t appeal to her. “As an older leader, I think an important part of leadership is stepping out of the way and making room,” Michelle Obama said. If she were to decide to run for office, it would limit the country, she said. “We’re not finding that new energy out there,” she said.